Preheat oven to 350° and place rack in the middle. Place a sheet pan in oven. Unroll pie crust and fit into a 9-inch pie plate. Flute edges. Lightly pierce the bottom of the crust with fork tines multiple times. Place on heated sheet pan and bake for 5 minutes. Remove pie crust from oven and cool. In a large bowl, whisk eggs until frothy. Whisk in brown sugar until completely incorporated. Mix in the butter, corn syrup, salt, cinnamon and vanilla. Fold in 2 cups pecans. Pour mixture into pie crust. 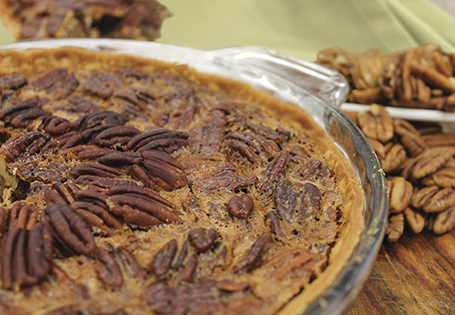 Using the remaining 1/2 cup pecans, create a pattern or design on top of the pie. Return pie to sheet pan and place in the oven, bake for 10 minutes. Using aluminum foil, wrap the edge of the crust so it does not burn. Bake for additional 35 minutes or until the center is set. Cool on a wire rack for 30 minutes, then refrigerate for one hour.